The first recorded history appears in the chronicles of North African (Berber) traders, who, from early Roman times, conducted a caravan trade across the Sahara in salt, slaves, gold, and other goods. The southern terminals of the trans-Saharan trade routes were located on the edge of the desert, and from there supplemental trade extended as far south as the edge of the rain forest. The more important terminals—Djenné, Gao, and Timbuctu—grew into major commercial centres around which the great Sudanic empires developed. The presidential elections that should have been organized in 2005 were postponed until November 2010. The preliminary results announced independently by the president of the Electoral Commission from the headquarters of Ouattara due to concern about fraud in that commission. They showed a loss for Gbagbo in favour of former prime minister Alassane Ouattara. ^ The latter being pronounced /ˌkoʊt diːˈvwɑːr/ KOHT dee-VWAR in English and [kot divwaʁ] (listen) in French. The communes of Ivory Coast are a fifth-level administrative unit of administration in Ivory Coast. The sub-prefectures of Ivory Coast contain villages, and in select instances more than one village is combined into a commune. There are currently 197 communes in the 510 sub-prefectures. Prior to 2011, communes were the third-level administrative units of the country. Under the administration of Laurent Gbagbo, the number of communes grew to more than 1300. In 2011, a reorganisation of the country's subdivisions was undertaken, with a goal of decentralising the state. As part of the reorganisation, communes were converted from third-level divisions into fifth-level divisions. In March 2012, the government abolished 1126 communes on the grounds that under the new jurisdiction of districts, regions, departments, and sub-prefectures, these particular communes were not viable governmental units economically. As a result of the reorganisation, there are now 197 communes in Ivory Coast. In many parts of the country, responsibilities previously carried out by the communes have been transferred to other levels of government. In most cases, the town that is the seat of the commune is also the seat of a sub-prefecture. Departments of Ivory Coast (French: départements de Côte d'Ivoire, also known as collectivités territoriale) are currently the third-level administrative subdivision of the country. Each of the 31 second-level regions of Ivory Coast is divided into two or more departments. (The autonomous districts contain no regions, but they do contain departments.) Each department is divided into two or more sub-prefectures, which are the fourth-level subdivisions in Ivory Coast. As of 2016, there are 108 departments of Ivory Coast. There is one area of Ivory Coast that is not governed by departments: the portion of Comoé National Park that is within Zanzan District is not assigned to any department. Departments were first created in 1961. During their existence, they have been first-, second-, and third-level administrative subdivisions. In July 2004, Drogba moved to Premier League club Chelsea for a club record £24 million fee, making him the most expensive Ivorian player in history. In his debut season he helped the club win their first league title in 50 years, and a year later he won another Premier League title. His displays saw him named in the FIFA World XI for 2007. In March 2012, he became the first African player to score 100 Premier League goals. Just two months later, he scored in Chelsea's 2012 FA Cup Final win over Liverpool to become the first (and as of 2017, the only) player to score in four separate FA Cup finals. He also played in the 2012 UEFA Champions League Final, in which he scored an 88th-minute equaliser and the winning penalty in the deciding shoot-out against Bayern Munich. After spending 6 months with Shanghai Shenhua in China, and one and a half seasons with Turkish club Galatasaray where he scored the winning goal in the final of the 2013 Turkish Super Cup, Drogba returned to Chelsea in July 2014. With a career record of scoring 10 goals in 10 finals winning 10 trophies at club level, Drogba has been referred to as the "ultimate big game player." He joined Canadian club Montreal Impact in 2015 as a Designated Player and played 41 matches over two seasons, scoring 23 goals. Drogba became a player–owner for Phoenix Rising of the United Soccer League in 2017, and retired a year later at the age of 40. The districts of Ivory Coast (French: districts de Côte d’Ivoire) are the first-level administrative subdivisions of the country. The districts were created in 2011 in an effort to further decentralise the state, but in practice most of them have not yet begun to function as governmental entities.There are 14 districts, including two autonomous districts around the cities of Yamoussoukro and Abidjan. The remaining 12 districts are further subdivided into 31 regions, which are further subdivided into 108 third-level subdivisions, the departments (French: départements). Departments are subdivided into 510 sub-prefectures (French: sous-préfectures). The lowest level of administrative organisation, which exist in limited numbers, is the commune. Although they are not divided into regions, the autonomous regions do contain departments, sub-prefectures, and communes. The First Ivorian Civil War was a conflict in the Ivory Coast (also known as Côte d'Ivoire) that began in 2002. Although most of the fighting ended by late 2004, the country remained split in two, with a rebel-held north and a government-held south. Hostility increased and raids on foreign troops and civilians rose. As of 2006, the region was tense, and many said the UN and the French military failed to calm the civil war. The date of the first human presence in Ivory Coast (officially called Côte d'Ivoire) has been difficult to determine because human remains have not been well preserved in the country's humid climate. However, the presence of old weapon and tool fragments (specifically, polished axes cut through shale and remnants of cooking and fishing) in the country has been interpreted as a possible indication of a large human presence during the Upper Paleolithic period (15,000 to 10,000 BC), or at the minimum, the Neolithic period. The earliest known inhabitants of Côte d'Ivoire, however, have left traces scattered throughout the territory. Historians believe that they were all either displaced or absorbed by the ancestors of the present inhabitants. Peoples who arrived before the 16th century include the Ehotilé (Aboisso), Kotrowou (Fresco), Zéhiri (Grand Lahou), Ega and Diès (Divo). Ivory Coast has produced several notable players who have played in Europe, including Didier Drogba, Yaya Touré, Emmanuel Eboué, Wilfried Bony, Seydou Doumbia, Gervinho, Eric Bailly, Serge Aurier, Nicolas Pépé, Maxwel Cornet, Wilfried Zaha, Ibrahim Sangaré, Salomon Kalou and Kolo Touré. Having become a fixed presence in the World Cup (since 2006) and having won the 2015 Africa Cup of Nations, the team is generally considered to be one of the best African teams of the last decade. This is also confirmed by FIFA Ranking in the reference period, never been so high for Les Éléphants. US–Ivorian relations are bilateral international relations between the United States and Ivory Coast.Ivory Coast is one of the most pro-American nations in Africa and the world, with 85% viewing the U.S. favorably in 2002, and rising to a high of 88% in 2007. Kolo Abib Touré (born 19 March 1981) is an Ivorian football coach and former footballer. He played as a defender for Arsenal, Manchester City, Liverpool, Celtic and the Ivory Coast national team. He is currently a first team coach at Leicester City as well as a member of the coaching staff for the Ivory Coast. Beginning his career at ASEC Mimosas, Touré moved to Arsenal in 2002, where he made 326 appearances for the club and was a member of the 03–04 'invincibles' side. In 2009, he moved to Manchester City, where he was joined a year later by his younger brother Yaya Touré, helping City earn its first league title in 44 years. In 2013 Touré transferred to Liverpool. He is one of the eight players who have won the Premier League with two clubs, having won it with Manchester City and Arsenal. He also won the Scottish Premiership with Celtic. Touré is the second-most capped player for the Ivory Coast, with 120 appearances from 2000 to 2015. He represented the team at the 2006, 2010 and 2014 FIFA World Cup tournaments. Touré also represented the Ivory Coast at seven Africa Cup of Nations tournaments between 2002 and 2015, helping them finish runner-up in 2006 and 2012, while winning in 2015. 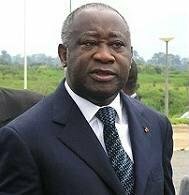 Koudou Laurent Gbagbo (Gagnoa Bété: Gbagbo [ɡ͡baɡ͡bo]; French pronunciation: ​[loʁɑ̃ baɡbo]; born 31 May 1945) is an Ivorian politician who was the President of Côte d'Ivoire from 2000 until his arrest in April 2011. A historian, Gbagbo was imprisoned in the early 1970s and again in the early 1990s, and he lived in exile in France during much of the 1980s as a result of his union activism. Gbagbo founded the Ivorian Popular Front (FPI) in 1982 and ran unsuccessfully for president against Félix Houphouët-Boigny at the start of multi-party politics in 1990. 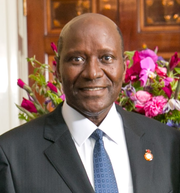 He won a seat in the National Assembly of Côte d'Ivoire in 1990. This is a list of airlines currently operating in Cote D'Ivoire. The following is a list of heads of government of Ivory Coast, officially the Republic of Côte d'Ivoire, since the country gained independence from France in 1960. 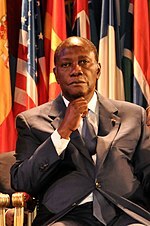 The following is a list of heads of state of Ivory Coast, officially the Republic of Côte d'Ivoire, since the country gained independence from France in 1960. The regions of Ivory Coast (French: régions de Côte d'Ivoire) are the second-level subdivisions of Ivory Coast. There are 31 regions, and each region is subdivided into two or more departments, the third-level division in Ivory Coast. Two to four regions are combined to make up a district, the first-level subdivision. The two autonomous districts of Ivory Coast are not divided into regions. Sub-prefectures of Ivory Coast (French: sous-préfectures de Côte d'Ivoire) are the fourth-level administrative subdivisions of the country. There are currently 510 sub-prefectures. They were created in 2011, when the administrative subdivisions of Ivory Coast were reorganised. In Ivory Coast, there are 14 first-level districts (including two autonomous districts) sub-divided into 31 regions, which are sub-divided into 108 departments (French: départements), which are further sub-divided into 510 sub-prefectures. The sub-prefectures contain more than 8000 villages nationwide. Where needed, multiple villages have been combined into 197 communes. The two autonomous districts are not divided into regions, but they do contain one or more departments as well as sub-prefectures and communes. Two areas of the country are not subdivided into sub-prefectures. First, the urban portion the Autonomous District of Abidjan—constituting Abidjan City proper—contains no sub-prefectures, only communes, although the more rural areas of the Autonomous District of Abidjan are divided into sub-prefectures. Second, the portion of the Comoé National Park that is located in Zanzan District is not divided into sub-prefectures. Visitors to Ivory Coast must obtain a visa from one of the Ivorian diplomatic missions unless they come from one of the visa exempt countries. All visitors must hold a passport valid for 6 months. Dazet Wilfried Armel Zaha (born 10 November 1992) is a professional footballer who plays as a forward for Premier League club Crystal Palace and the Ivorian national team. Zaha advanced into the Crystal Palace first team from their academy, in 2010. In January 2013, he transferred to Manchester United for an initial fee of £10 million, Alex Ferguson's last transfer before his retirement at the end of the season. Zaha remained on loan at Palace until the end of the season, helping them return to the Premier League. After an unsuccessful 2013–14 season with Manchester United (partly spent on loan at Cardiff City), Zaha returned to Palace in August 2014 on a season-long loan, before rejoining the club on a permanent basis in February 2015. Born in the Ivory Coast, Zaha grew up in England from the age of four. He made his debut for the England national team in 2012. He made two non-competitive appearances for England, the latter of which came in 2013, before switching his allegiances to the Ivory Coast ahead of the 2017 Africa Cup of Nations. Yamoussoukro (; French pronunciation: ​[jamusukʁo]) is one of the two political capitals and administrative capital of Ivory Coast and an autonomous district of the country, while the other capital of the country is Abidjan. As of the 2014 preliminary census, the district had a population of 355,573 inhabitants. Located 240 kilometers (150 mi) north-west of Abidjan, the administrative centre on the coast, upon rolling hills and plains, the municipality covers 3,500 square kilometers (1,400 sq mi). Prior to 2011, what is now the district of Yamoussoukro was part of Lacs Region. The district was created in 2011 and is split into departments of Attiégouakro and Yamoussoukro. In total, the district contains 169 settlements. Yamoussoukro is a sub-prefecture in Yamoussoukro Department and is also a commune: since 2012, it has been the sole commune in the autonomous district of Yamoussoukro. The current governor of the district is Augustin Thiam. Yamoussoukro is usually pronounced "Yam-So-Kro" by Ivorians.